Situated in northwestern Lancaster County, the Donegal School District is comprised of East Donegal Township, Marietta and Mount Joy Boroughs, and approximately one-third of Mount Joy Township. It’s close proximity to the Lancaster, York and Harrisburg metropolitan areas makes it a very desirable location for commuters, as it is located 24 miles east of Harrisburg and just 20 miles north east of York. Some popular villages and boroughts in the school district are: Chickies, Donegal Heights, Donegal Springs, Marietta, Maytown, and Rowenna. Marietta is one of the “PA Rivertownes” and offers a boat launch and friendly hiking trail overlooking the scenic Susquehanna River. 43% of the Marietta borough has been placed on the National Register of Historic Places. The area also features great restaurants, bed and breakfasts, hotels, plus several antique and gift stores, as well as many cultural events such as Marietta Day, Candlelight Tour, Pig Iron Fest and the 4th of July Carnival and Fireworks. Downtown Mount Joy is also a culturally rich, picturesque community that is renowned for its friendliness and hospitability. The historic district offers a diverse selection of bed and breakfasts and quality shopping and dining experiences, complemented by a restored art deco theater and a well-established antiques and arts community. Themed cultural opportunities, special events, celebrations and sporting events are held throughout the year. 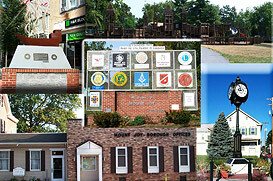 Main Street Mount Joy (MSMJ) is a charitable organization that is active in an exciting effort to revitalize, preserve and promote the richness of Downtown Mount Joy for the benefit of the businesses, residents, and visitors.